Eat chili, hang out at Jo’s, help people: what’s not to love? And now there’s another reason to love Jo’s. 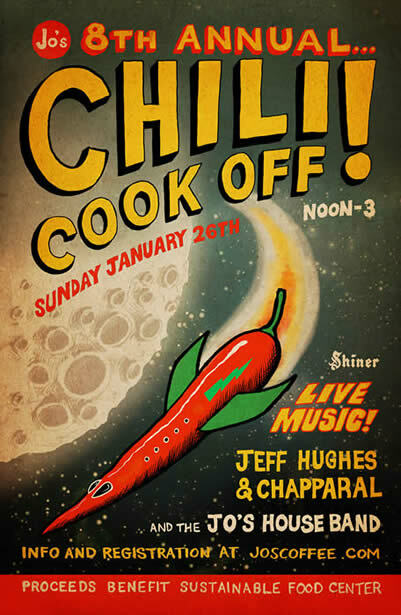 I just found out that Sunday January 26 it’s going to be the site for the 8th Annual Chili Cook-Off, sponsored by Shiner. The cook-off benefits the Sustainable Food Center, a wonderful local Austin charity working hard to make it possible for more people to have access to nutritious, affordable food through education, access to gardens and more. So all in all, that means South Congress, Jo’s Coffee Shop, chili, music (live music will be provided by Jeff Hughes & Chapparal, the Jo’s House Band and DJ Ben Nuhn), beer for those who love it (and I know a LOT of Austin folks do!) and a chance to do something really good for people who are struggling to put healthy food on their family dinner table. The festivities (including chili tasting!) start at noon and run until 3. And there are even prizes! Yes, some of those chili chefs will walk away with great prizes, so not only do you get to eat, you get to vote and help your fave cooks win some good stuff! It’s $20 to join in the event, and that includes samples of all 14 chili entries, plus all the great music and atmosphere you want to enjoy. Beer and other drinks will be for sale, so you can safely go ahead and take a bite or two of that habanero-spiked chili, then put out the fire. Jo’s is located at 1300 South Congress in Austin. This entry was posted in F is for Festivals, O is for Outdoors and tagged charity, chili, cookoff, downtown, events, festival. Bookmark the permalink.